The InsideTracker ethos is that it’s better to check your biomarkers before there is a reason to test (knowledge is power!). We believe that this is true for all of our biomarkers, but recently, the spotlight has been aimed at vitamin D by this article. 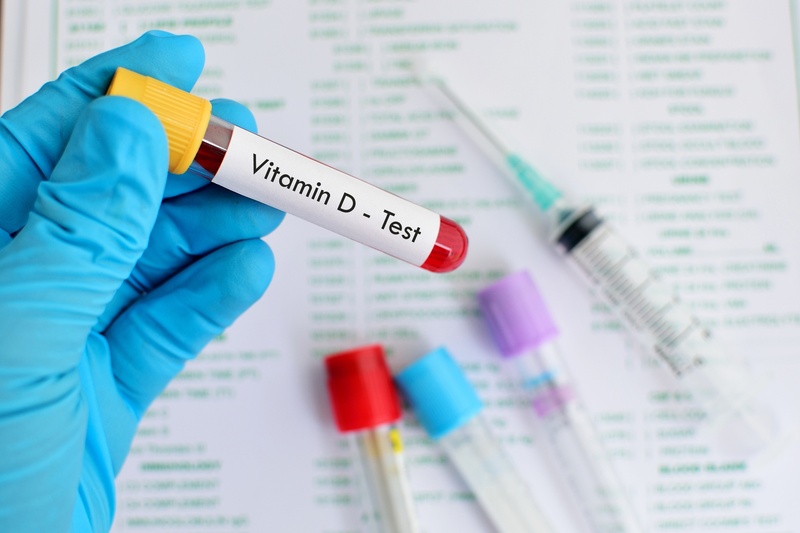 The writer claims that the testing of vitamin D levels is overdone and unnecessary, and that as a result there is a false “pandemic” of vitamin D deficiency. We at InsideTracker disagree with this entirely, and think that it is better to check if you have low vitamin D before you start seeing negative – or possibly irreversible –consequences, such as osteoporosis. Low levels of vitamin D are even fairly common among InsideTracker users; who tend to be very active and health-conscious! 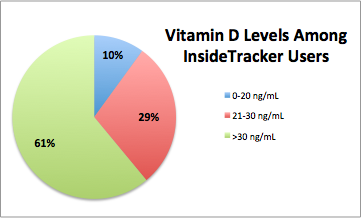 You can see in the chart below that 10% of InsideTracker users have vitamin D levels at or below 20 ng/mL (the cutoff for insufficiency listed in the NYT article), and 39% of users have levels below 30 ng/mL (what is currently the lower, “normal” range according to clinical laboratories). Based on the prevalence of low values found among InsideTracker users, it would be reasonable to estimate that there would be even more people with low vitamin D levels in the general population. The Times article based its arguments on two large papers that came out this year: one that shows a large, monthly dose of vitamin D does not affect incidence of heart disease, and another saying that vitamin D supplementation does not prevent cancer. The other study mentioned in the article reported that supplementing with vitamin D did not reduce outcomes of cancer3. However, if you look at the levels of vitamin D in the subjects, both groups had levels of vitamin D greater than 30 ng/mL. There is a large amount of evidence showing that the lowest risk of mortality (this includes cancer) is associated with vitamin D levels greater than 30 ng/mL, and there is no difference in risk if you are over this level.4,5,6 If they had compared the outcomes of cancer in a population with deficient levels of vitamin D <30 or 20 ng/dL, the conclusion may have been different. What level of vitamin D will give me health benefits? The question of what is the best level of vitamin D is the real crux of this debate. Do we need vitamin D levels above 30 ng/mL, or is 20 ng/mL adequate? At InsideTracker, we recommend that you have a vitamin D level greater than 32 ng/mL. But can’t too much vitamin D be dangerous? Now, if you are familiar with vitamin D supplements (as most InsideTracker consumers are), you know that this is an extremely high dose! Here at InsideTracker, the highest supplemental vitamin D dose that we recommend is 5,000 IU per day, and that is only for 8 weeks – until you can get your blood tested again. We then adjust our recommendations based on the change in your blood vitamin D levels. This issue also brings up one of the major benefits of testing through InsideTracker. Our platform explains your results, and guides you to your goals with specific recommendations tailored to your biomarker levels, your personal profile data, and your current diet and lifestyle habits. You won’t ever end up guessing the supplement dosage that’s right for you. Every one of our dosage recommendations is based on peer reviewed scientific evidence, and takes into account potential negative side effects. A common issue we see and that we should address here, though, is that just because something is good at one dose, does not mean that more is better. We choose our supplement doses for a reason, so you should follow your InsideTracker recommendations exactly, without modifying them. If you ever have a question about a supplement or your recommendation, you can always contact us. If you’re reading articles online arguing for or against the necessity of vitamin D supplementation, we urge you to go get tested because, in the end, as we like to say: "Blood doesn't lie!" Take your health into your own hands. You can use the InsideTracker platform to choose the best source of vitamin D that fits your lifestyle, whether that be through diet, supplementation, or simply getting some sun! Holick MF. Vitamin D Deficiency. New England Journal of Medicine 2007;357(3):266-81. Scragg R, Stewart AW, Waayer D, Lawes CM, Toop L, Sluyter J, Murphy J, Khaw KT, Camargo CA Jr. Effect of monthly high-dose vitamin D supplementation on cardiovascular disease in the vitamin D assessment study: A randomized clinical trial. JAMA Cardiology 2017. Lappe J, Watson P, Travers-Gustafson D, Recker R, Garland C, Gorham E, Baggerly K, McDonell SL. Effect of vitamin D and calcium supplementation on cancer incidence in older women: A randomized clinical trial. JAMA 2017;317(12):1234-43. Chowdhury R, Kunutsor S, Vitezova A, Oliver-Williams C, Chowdhury S, Kiefte-de-Jong JC, Khan H, Baena CP, Prabhakaran D, Hoshen MB, Feldman BS, Pan A, Johnson L, Crowe F, Hu FB, Franco OH. Vitamin D and risk of cause specific death: systematic review and meta-analysis of observational cohort and randomised intervention studies. BMJ 2014;348. Sempos CT, Durazo-Arvizu RA, Dawson-Hughes B, Yetley EA, Looker AC, Schleicher RL, Cao G, Burt V, Kramer H, Bailey RL, Dwyer JT, Zhang X, Gahche J, Coates PM, Picciano MF. Is there a reverse J-shaped association between 25-hydroxyvitamin D and all cause mortality? Results from the U.S. nationally representative NHANES. J Clin Endocrinol Metab 2013;98(7):3001-9. Zitterman A, Iodice S, Pilz S, Grant WB, Bagnardi V, Gandini S. Vitamin D deficiency and mortality risk on the general population: a meta-analysis of prospective cohort studies. Am J Clin Nutr 2012;95(1):91-100. Cranney A, Horsley T, O’Donnell S, Weiler H, Puil L, Ooi D, Atkinson S, Ward L, Moher D, Hanley D, Fang M, Yazdi F, Garritty C, Sampson M, Barrowman N, Tsertsvadze A, Mamaladze V. Effectiveness and safety of vitamin D in relation to bone health. Evid Rep Technol Assess (Full Rep) 2007;158:1-235. Ross AC, Manson JE, Abrams SA, Aloia JF, Brannon PM, Clinton SK, Durazo-Arvizu RA, Gallagher JC, Gallo RL, Jones G, Kovacs CS, Mayne ST, Rosen CJ, Shapses SA. The 2011 report on dietary reference intakes for calcium and vitamin D from the Institute of Medicine: What clinicians need to know. J Clin Endocrinol Metab 2011;96(1):53-8. Wyon MA, Koutedakis Y, Wolman R, Nevill AM, Allen N. The influence of winter vitamin D supplementation on muscle function and injury occurrence in elite ballet dancers: a controlled study. J Sci Med Sport 2014;17(1):8-12. Forney LA, Earnest CP, Henagan ™, Johnson LE, Castleberry TJ, Stewart LK. Vitamin D status, body composition, and fitness measures in college-aged students. J Strength Cond Res 2014;28(3):814-24. Nimptsch K, Platz EA, Willett WC, Giovannucci E. Association between plasma 25-OH vitamin D and testosterone levels in men. Clin Endocrinol (Oxf) 2012; 77(1):106-12. Pilz S, Frisch S, Koertke H, Kuhn J, Dreier J, Obermayer-Pietsch B, Wehr E, Zitterman A. Effect of vitamin D supplementation on testosterone levels in men. Horm Metab Res 2011;43(3):223-5. Wentz L, Berry-Caban C, Eldred J, Wu Q. Vitamin D correlation with testosterone concentration in US army special operations personnel. FASEB 2015;29(1). Tak YK, Lee JG, Kim YJ, Park NC, Kim SS, Lee S, Cho BM, Kong EH, Jung DW, Yi YH. Serum 25-hydroxyvitamin D levels and testosterone deficiency in middle-aged Korean men: a cross-sectional study. Asian J Androl 2015;17(2):324-8. Kim JH, Chang JH, Kim DY, Kang JW. Association between self-reported sleep duration and serum vitamin D level in elderly Korean adults. J Am Geriatr Soc 2014;62(12):2327-32. Massa J, Stone KL, Wei EK, Harrison SL, Barrett-Connor E, Lane NE, Paudel M, Redline S, Ancoli-Israel S, Orwoll E, Schernhammer E. Vitamin D and actigraphic sleep outcomes in older community-dwelling men: the MrOS sleep study. Sleep 2015;38(2):251-7. Huang W, Shah S, Long Q, Crankshaw AKm Tangpricha V. Improvement of pain, sleep, and quality of life in chronic pain patients with vitamin D supplementation. Clin J Pain 2013;29(4):341-7. Mayo Clinic. “Vitamin D toxicity: What if you get too much?” Retrieved from: http://www.mayoclinic.org/healthy-lifestyle/nutrition-and-healthy-eating/expert-answers/vitamin-d-toxicity/faq-20058108.